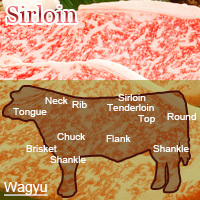 Beef sirloin is located far in the back of beef roast between rib roast and the rump of cattle. It is primarily used when cooking steak. Japanese beef (called "wagyu") in Japan is considered a highly marbled meet meaning it has large amount of intramuscular fat in addition to high omega-3 and omega-6 fatty acid content. The calories in Japanese Beef Sirloin per 100g(1cut ) is 498 calories. Japanese Beef Sirloin is calculated to be 498Cal per 100 grams making 80Cal equivalent to 16.06g with 47.5g of mostly fat、11.7g of protein、0.3g of carbohydrates in 100g while being rich in vitamins and minerals such as Vitamin B12 and Niacin.